Yes, that’s right – it may be 17 full days, open to the public, but there is a hidden Day 18. The final Tuesday of the Book Fest is Schools’ Gala Day, with the whole site given over during school hours to teeming classes of kids. There was balloon modelling and packed lunches under the trees, while Julia Donaldson and her 34 tonnes of equipment and picture book characters began the day in the main theatre, with 570 excited children. Many of these groups have been coached in from schools hours away from Edinburgh, getting up in the early hours to make it to the very final day of the Festival. 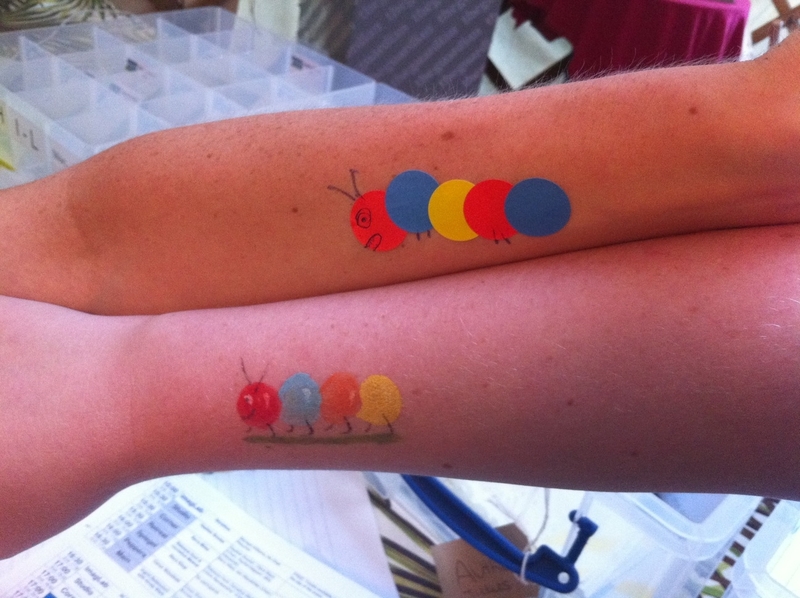 We painted caterpillars on our arms, and spiders on our faces, and generally had as much fun as the children. 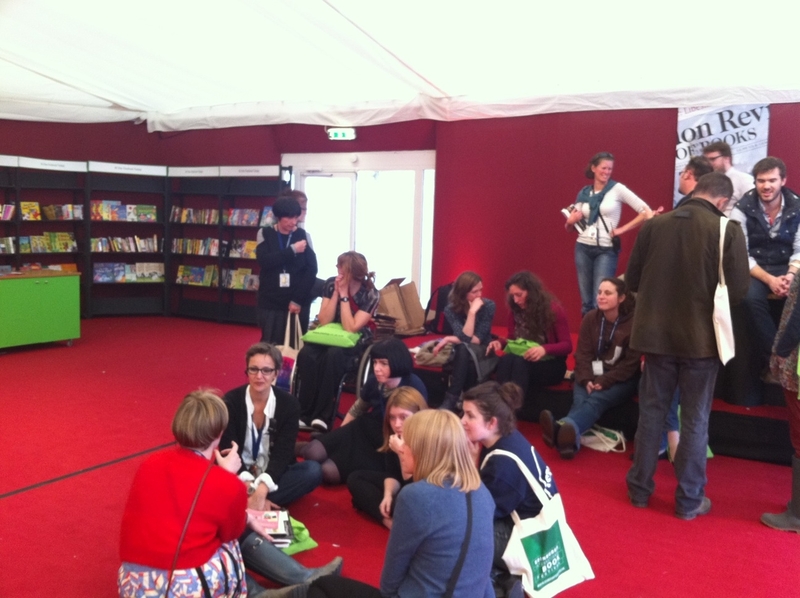 We then lined up for an annual institution that is taken very seriously by all – the Book Grab. Book Grab is very special. The publisher of each author appearing must supply three copies of their book, for the panellists, chairs and staff to read before the Festival begins: by the end, these books are no longer required and are in need of loving homes. The Signing Tent is cleared of stock, and these copies take to the shelves. We line up behind the black tape starting mark, and the only rules are ‘no biting, no gouging’. As the whistle goes, around 100 grown-ups race for the books they’ve had their eye on all year, and emerge triumphantly, with an eclectic reading list in their arms. 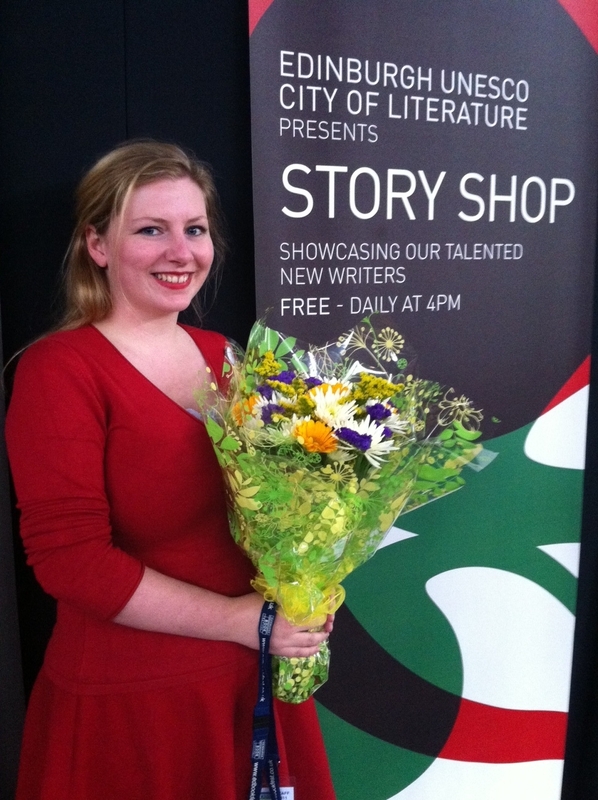 I’ve programmed Story Shop for the last five years, taking over from an inaugural National Short Story Prize series initiated by Faith Liddell, now head of Festivals Edinburgh. 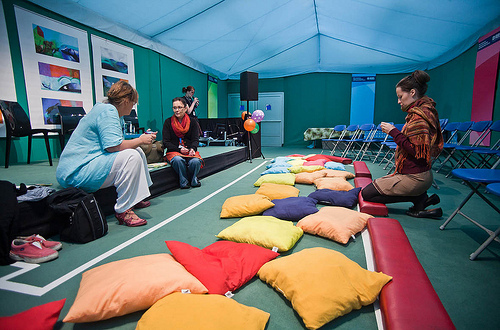 Over that time, more than 3,000 people have listened to more than 60 short stories at the Edinburgh International Book Festival, and I’m chuffed that so many people came to listen to Edinburgh’s emerging writers this year. City of Literature Director Ali gave me some rather lovely flowers, ever so slightly upstaging our final 2011 reader, Angela Jackson. You can read all of the stories, and hear me interview each of the new authors, on the City of Literature website. I had to give in and buy a pair of flat black pumps – pretty heels and wading around in the mud really don’t go together. More importantly, I needed a sensible pair to tackle the Book Grab. The tactic worked, and I now have a pile of hardback biographies that should keep me reading through the winter months. Anna, you’re a star both for all you do with the Story Shop, and for keeping us all so thoroughly entertained with your daily diary. Thank you!